One of the curious societal circumstances is that poisonous drugs are allowed to be sold over the counter in an unregulated fashion and nontoxic ones are restricted. I don't understand why this is so, only that it is so. 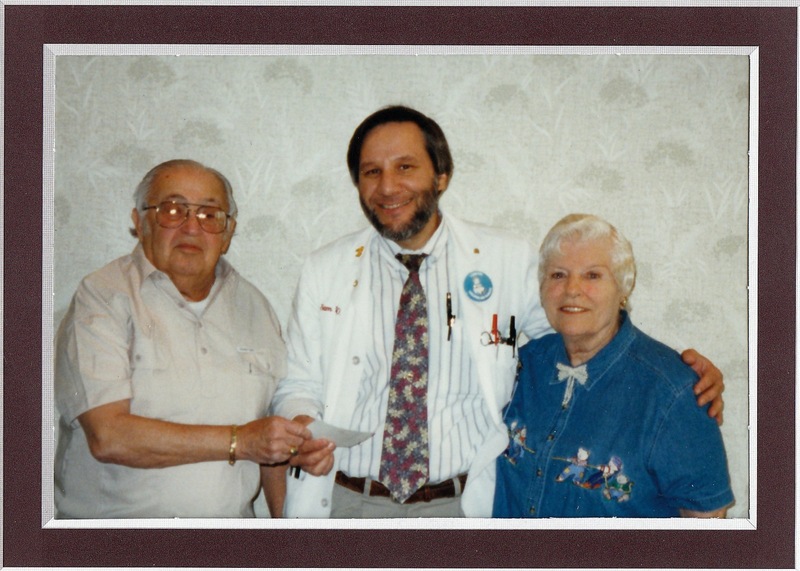 One of the oldest medicines in use is aspirin. 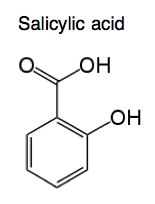 Salicylic acid was initially extracted from willow bark ( from latin salix=willow tree) and subsequently made synthetically. It is a phenolic phytohormone which acts throughout the plant to induce defensive responses in the plant to pathogens. Volatile methyl-salicylate is naturally produced by the willow when stressed and will induce a similar response in nearby plants when they are exposed to the vapours. Willow was used as a herbal remedy for fevers, pain, acne and arthritis. It has an assortment of side effects like urticaria ( rash) deafness, metabolic acidosis and Reyes syndrome. Continuing applications of Salicylic acid are for acne, as a treatment of dandruff and for dissolving calluses as an exfoliative (removes dead skin). 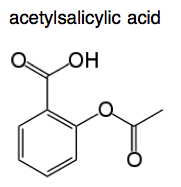 In 1897 the Bayer company modified Salicylate by acetylation and "Aspirin" (acetylsalicylic acid ) was born. This was aggressively marketed by Bayer even though it had been first synthesized by the French chemist Gerhardt in 1853. 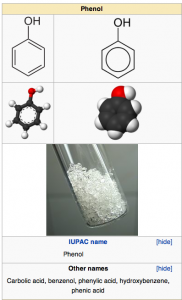 It was better tolerated that the simple salicylate compound and had additional effects. It is estimated that currently 40,000 tonnes are consumed annually! Bayer laboratories was a busy place and one of the things they were working on in 1865 was a synthetic blue dye to replace the expensive and uncommon plant derived blue indigo dyes. These indigo dyes were rare and expensive enough to be called "blue gold" in ancient India. The natural dyes are a metabolite of the ring/cyclic amino acid Tryptophan, made by the specific fermentation of certain plants in big piles by the Indians to create the blue color. The destructive distillation of indigo in 1826 produced aniline, a toxic ring compound related to phenol and benzene. 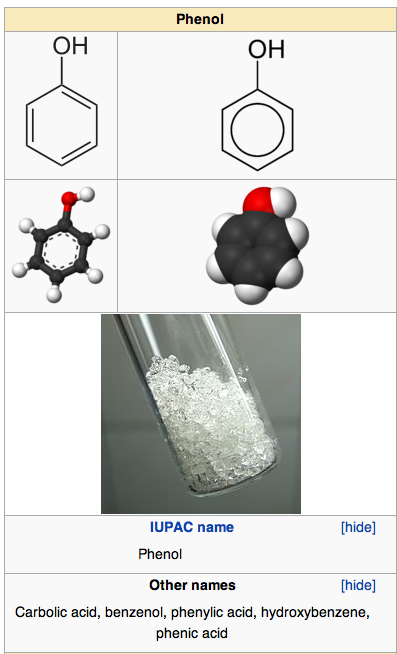 This chemical is used for many chemical reactions including the production of polyurethanes and many dyes in the "colourant industry". A cheap and reliable aniline purple dye was made accidentally by 18 yr old William Henry Perkin in england who was attempting to make quinine in chemistry class. Because He was a student and not employed by a chemical firm, he was able to patent the compound and build a fortune in the dye works. 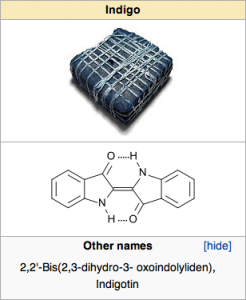 Later variations of this compound were used for "ditto" machines to print those fragrant blue copies that many of us remember. It was probably carcinogenic too! While experimenting with aniline, the bayer company made a white powder from coal- tar derived aniline which they called phenacetin or acetanilide. Since it was colorless and not useful as a dye, they wondered what they could do with it to make money........ So they gave it to sick people! It would block fever and people who took it would have less pain complaints but a significant number of them would unfortunately turn blue and die. The compound is a general metabolic poison and will often induce methemoglobinemia or even wide spread acute hemolysis. 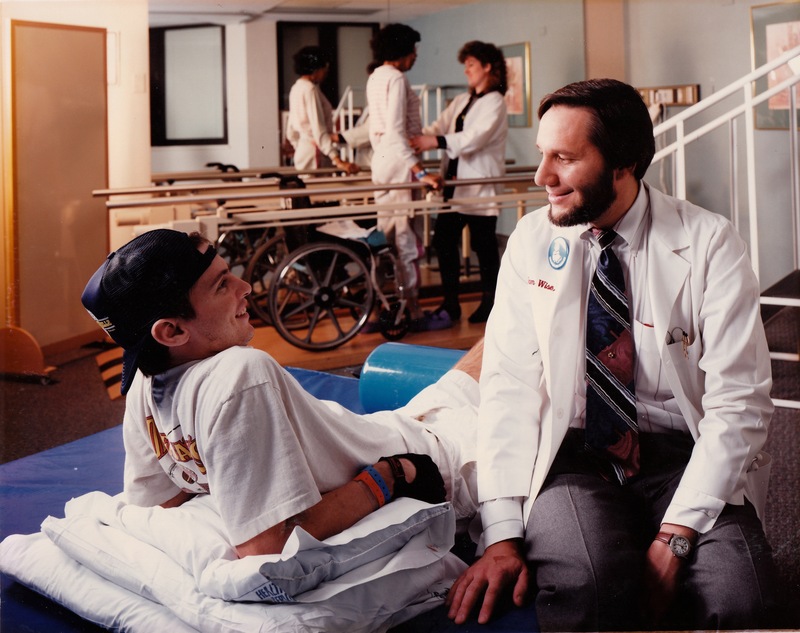 Despite those little problems it was widely marketed as APC (aspirin-phenacetin-caffiene) until being withdrawn from the market in 1983 because of cancer causing and kidney killing effects (renal papillary necrosis). If that doesn't kill you right away , it caused cancer of the kidneys and urological tract (likely other cancers as well). 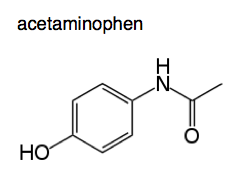 A metabolite of phenacetin was observed, then synthesized and has been independently marketed since 1887, it is called acetaminophen or paracetamol or APAP or Tylenol. 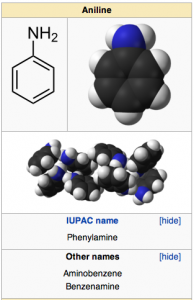 It is the first direct metabolite of phenacetin in people. It was mixed with various other compounds most notably with codeine to limit the "abuse " of codeine and make those who took too much codeine ill! (curiously codeine and the other narcotics are notably NON_TOXIC in comparison to acetaminophen). How does such a regulatory mind work that would add a poison to a non-toxic medicine purposely to make people sick? For discussion, codeine is a natural narcotic chemical derived from the poppy. Other natural narcotics are morphine and theobaine . Morphine was isolated from the poppy in 1804 and it's structure as a complex polycyclic was not defined till much later. Chemically Modified semi-synthetic) narcotics in common use today are hydrocodone and oxycodone. When they are mixed with acetaminophen/APAP they are called lortab or percocet respectively. These are very common medications and amount to huge $ in the "pharmaceutical " trade. So what is the problem You may ask? Despite increasing irrefutable data about the toxicity of acetaminophen , it is still being taken like candy over the counter. It is in many witches-brew compounds and is an adulterant in narcotic prescriptions (such as percocet, tylenol- codiene , and lortab). Acetaminophen is a leading cause of liver disease in the world through acute and chronic mechanisms! Acetaminophen associated Kidney disease is well known and the increase in cancers of all types is highly suspect. There is evidence that Alzheimer's disease is linked with intake of acetaminophen . Taking tylenol with narcotics is particularly bad because the less poisonous / more natural narcotics are better suited to our metabolism and get preferential attention by our liver cytochrome p450 enzymes. 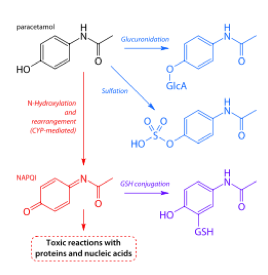 When this happens, acetaminophen is shunted to a secondary pathway of N-hydroxylation to form the toxic alkylating metabolite NAPQI which irreversibly attacks glutathione and other important compounds in our bodies ( like our DNA and critical proteins). Some people have metabolisms which preferentially produce NAPQI from acetaminophen even without having any competing compounds like the narcotics present. Having even the smallest amount of alcohol in your system when taking acetaminophen is equally toxic. Because the liver metabolism prioritizes natural chemicals like alcohol and pushes un-natural chemicals like acetaminophen to N-hydroxylations pathways it is imperative to Avoid having any acetaminophen intake with alcohol. When the increasing incidence of cancers of all types are noted, the wide spread ingestion of acetaminophen is very concerning. I would like to see acetaminophen banned in all forms. Just recently, A new "black box warning" has been put on acetaminophen products stating that it may cause liver failure. It should say "does and will cause liver failure". Tylenol is particularly poisonous to Cats! Even with very small amounts they have untreatable hemolysis (rupturing of the red blood cells) with methemoglobinemia , kidney failure , turn blue and suffocate/asphyxiate. Snakes are poisoned just like cats. Dogs suffer liver damage. Use of acetaminophen to poison brown tree snakes in Guam has recently resurfaced but the article entirely leaves out the facts about acetaminophen toxicity in people. They neglected to mention that acetaminophen is also poisonous to fish, birds, mammals, cats, dogs and essentially all animals . Any cat which eats the dead mouse full of acetaminophen will die too. Acetaminophen overdose is a major problem and is associated with irreversible liver damage leading to liver failure and then death over a 2 to 3 day period, There is only limited treatment possible for acetaminophen overdose and no cure for the liver failure. I ask: " Why has poisonous acetaminophen not been removed from the market ?" You know the answer............ big $$$$ to be lost by reduced direct sales and profits made due to the causative indirect disease . Consider that world production of acetaminophen/paracetamol is estimated at 145,000 tonnes (metric tons) or 319,670,280 lbs or 290,000,000,000 tablets of 500 milligram dosage. So, please avoid taking acetaminophen in any form. Ask to have narcotic analgesics in their pure form without added poisonous APAP. Take an aspirin instead, but only now and then and never give one to your cat because it will poison them almost the same as APAP. Choose to avoid poisonous acetaminophen in any and all forms!